Providing a near beachfront location is the Primavera Park Apartments, nestled just 700 yards away from sandy Playa de Levante. 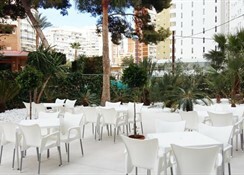 Guests of this hotel are sure to experience a tranquil stay in Benidorm, with the benefit of the sandy beach and the lively Old Town just a short walk away. There are 176 guest rooms at Primavera Park Apartments spread over 11 floors (offering great views of the resort), which are available to book in a couple of different styles – all of which however are comfortable and functional. Take advantage of excellent facilities including two swimming pools (one for adults and one for children), a pool table, terrace area and café. The hotel also offers a large gastronomic selection at its on-site restaurant which offers a mixture of Mediterranean, traditional and international cuisine sure to please all tastes, or guests can easily explore the local fare available in the surrounding area. The Primavera Park Apartments is well-suited for couples, single parents and families alike seeking a quality stay in the sun. 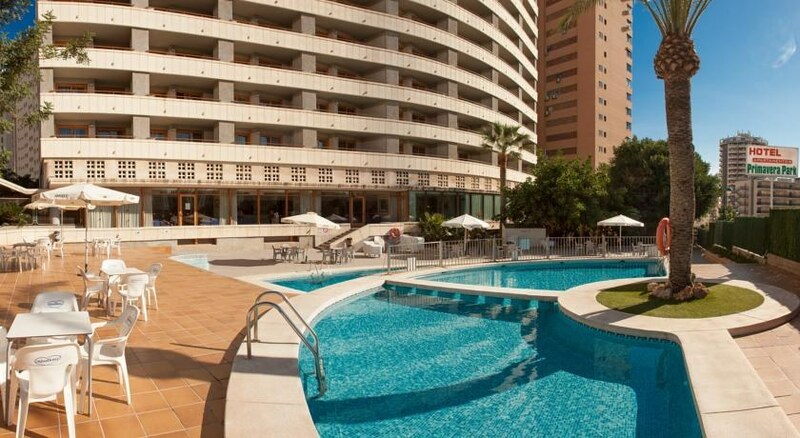 The Primavera Park Apartments are just a short walk away from the sandy beach and the pretty Old Town in Benidorm – so you can spend time by the coast or get a taste for the resort’s culture. They also offer easy access to the main tourist attractions such as the Aqualandia Water Park (1.9 miles) and Terra Mitica Theme Park (2.3 miles) which make for a great day out with the kids. There are several golf courses around Benidorm too, such as the Villaitana Golf Course, which is 2.8 miles away. 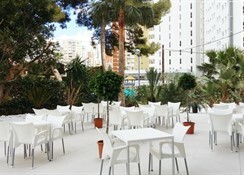 The nearest airport is the Alicante International airport which is 29 miles from the property. There are 176 available rooms at Primavera Park Apartments which can sleep between two and four people. The Apartments have two single beds (or one double bed) with a sofa bed and separate living and sleeping area. There are also Double Rooms suitable for two adults and suites available. 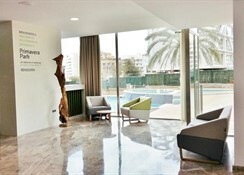 All of the rooms here come equipped with air conditioning, Wi-Fi and the apartments have kitchens. 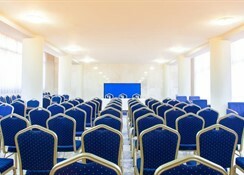 There is a large buffet restaurant at the Primavera Park Apartments providing a variety of cuisines for breakfast, lunch and dinner, as well as an on-site café and bar for lighter snacks. Given its central location, the property is within walking distance of the Old Town which has a wide selection of bars and restaurants to indulge in. There are two swimming pools at the property, one suited to adults and the other suited to children – both with loungers around the outside. The resort also offers entertainment facilities including pool tables and a games room, plus the nearest beach is just a short stroll away boasting watersports and other exciting activities. Guests can also play 18 holes on the various golf courses around Benidorm if they wish, while there are several water parks and theme parks in the area too that will make a great day out for the little ones. Loved the hotel, very clean, however our only negative comment was during the first 10 days of a 14 day visit the restaurant was very overcrowded. We had to queue for every meal and it took us 10 / 15 minutes to collect our food from the servery. The location suited us as it was a 10 minute walk from the beach and not in the "Jeremy Kyle" part of town. The pool area whilst busy was never overcrowded with most of the hotel residents going to the beach.